Ewa riro which is also referred to as beans porridge or stewed beans is a Nigerian delicacy from the Yoruba speaking part of the country. It is made by boiling beans until it’s tender, then we stew it up. Yes, it’s that easy. ”Ewa” means ”Beans” and ”Riro” means ”stirred” so ”Ewa riro” literally means ”stirred Beans” but this time around it’s Beans stirred in a type of stew or simply put ”stewed Beans”. We definitely do love beans in Nigeria and we’ve got a lot of Beans recipes like Moin moin (steamed beans pudding), Akara (Beans Fritters), Ewa Aganyin (Mashed Beans) and much more. To prepare this delicacy, it’s important to start with a freshly picked Beans. This is important because chewing on stones while eating is not a pleasant experience at all. 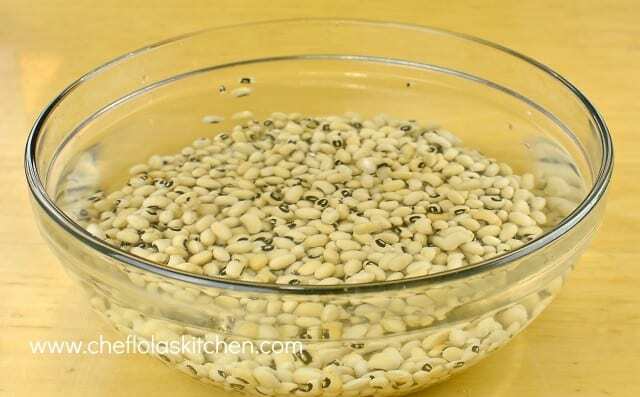 You can either use the Nigerian Honey Beans or Black eyed peas for making this meal but I am using the Black eyed peas today. The next thing I do is to soak the beans. Why? It’s simply because it is believed that this reduces the gas in the beans which in turn gives room for easier digestibility. Feel free to use a pressure cooker if you have one and this will shorten your cook time. I also like to use the crockpot in preparing my beans as I always like the outcome. 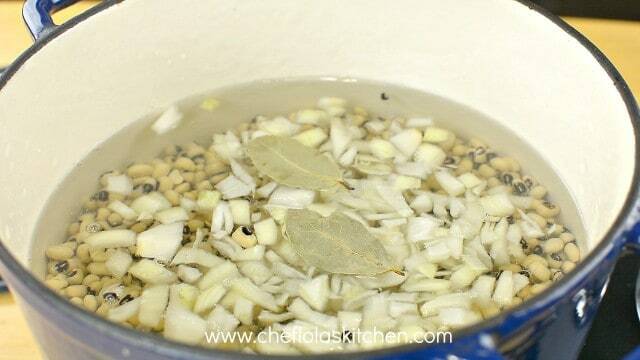 Rinse out the Beans and pour it into a pot, add the diced onions and bay leaves. Cook until the Beans is very tender. This should take about 1 hour to 1 hour 15 minutes. 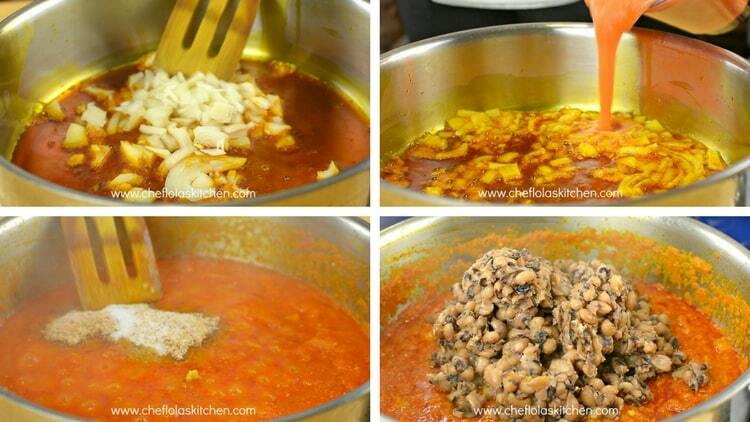 Once the Beans is well cooked and soft add some salt to taste, mix it together then set it aside and make the Sauce. Better still, make the sauce while the Beans is still cooking. 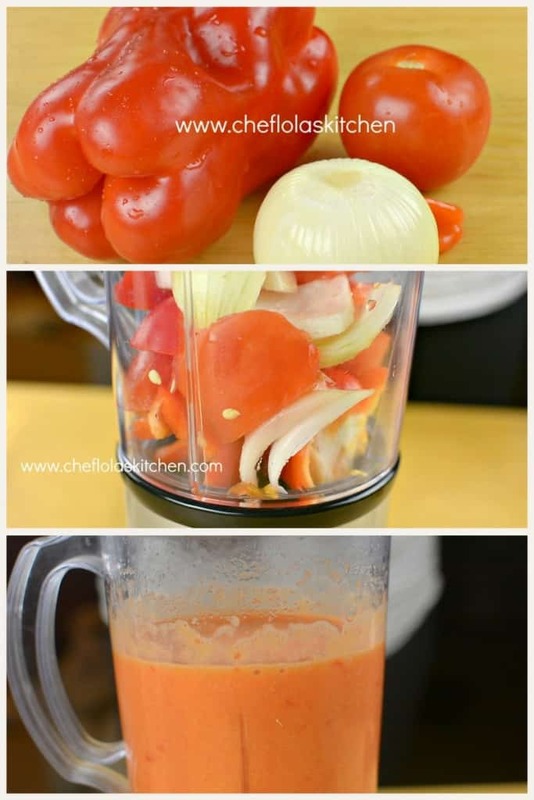 For the Sauce, blend the peppers and Onions together and set it aside. Note; When making Ewa riro, you can make your work a lot easier by skipping this stage if you have the Nigerian stew on hand. Simply add the stew directly to the boiled Beans together with palm Oil, Crayfish, stock cube (if needed) and Salt to taste. I personally do this whenever I have the Nigerian stew readily available and I love it. Fry the Onions in the preheated Palm Oil (you don’t need to bleach the Oil) until the onions are soft, You necessarily don’t need to brown them: Stir in the blended pepper and cook until the sauce is reduced. Add the stock cube, crayfish, and Salt. Mix until all the ingredients are well combined and stir in the Beans. Don’t forget to adjust the water level and seasoning at this point if there is a need to. Cover it up and leave to simmer for about 3 to 5 minutes and your beans porridge is ready! Note: The reason why this sauce needs to be cooked is ensure that we get rid of that raw pepper taste in the pepper. Ewa riro which is also referred to as beans porridge or stewed beans is a Nigerian delicacy from the Yoruba speaking part of the country. It is made by boiling beans until it's tender, then we stew it up. Yes, it's that easy. ''Ewa'' means ''Beans'' and ''Riro'' means ''stirred'' so ''Ewa riro'' literally means ''stirred Beans'' but this time around it's Beans stirred in a type of stew or simply put ''stewed Beans''. 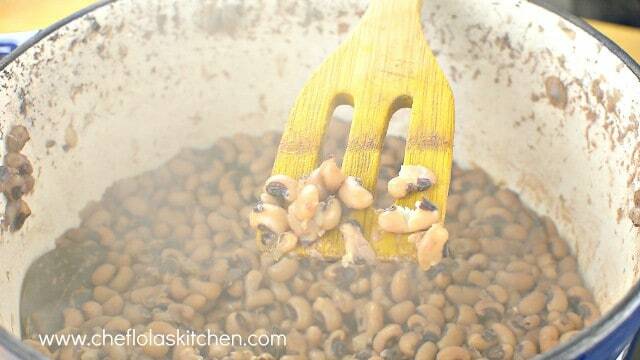 Pick out the debris in the Beans and soak for about 6 to 8 hours or overnight. Season and stir in the Salt, stock cube and Crayfish. Stir in the boiled Beans and leave to simmer for about 3 to 5 minutes. Serve with Plantains, Bread or Garri. Enjoy!